I love finding convergent architectural elements scattered about the city. Geometric glass block, Midcentury 2-flats, green-on-white glazed brick storefronts – whenever I see something popping up in a variety of places all over town, I’m hooked. 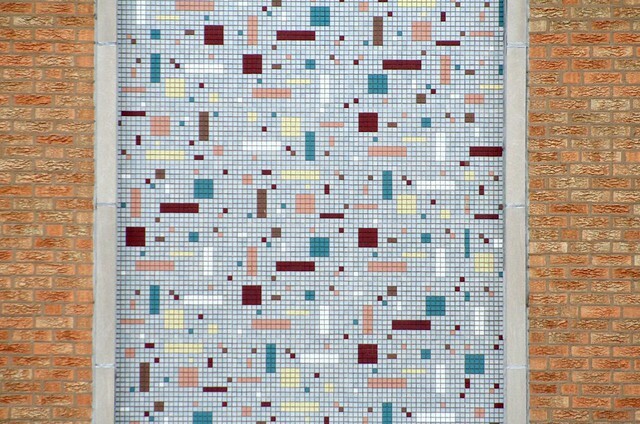 My latest find in this vein – 1960s-era 1×1 tile mosaics. 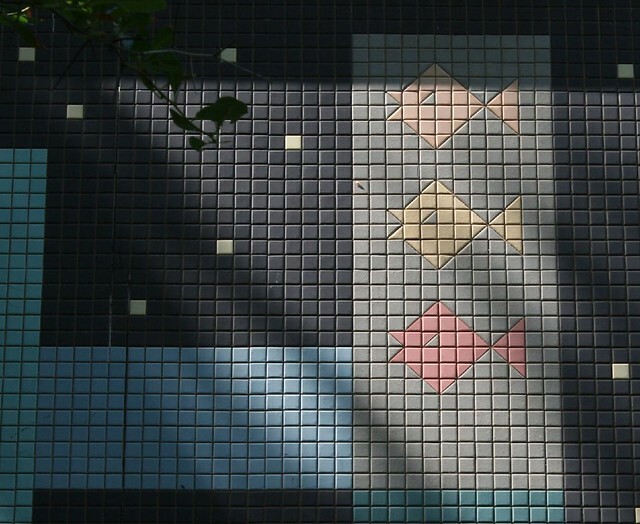 Using common construction materials, which could be installed by commonly-skilled workers, 1×1 tiles allowed an artist to create colorful additions to a building’s exterior. For curves and added levels of detail, the titles could be cut in half with a 90-degree angle. 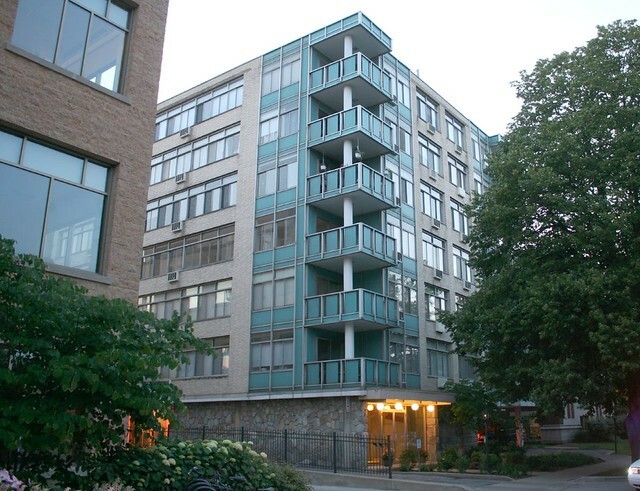 An apartment building from circa 1960 turned condo, with wonderful projecting balconies on two of the corners, trimmed out with blue metal spandrel panels. 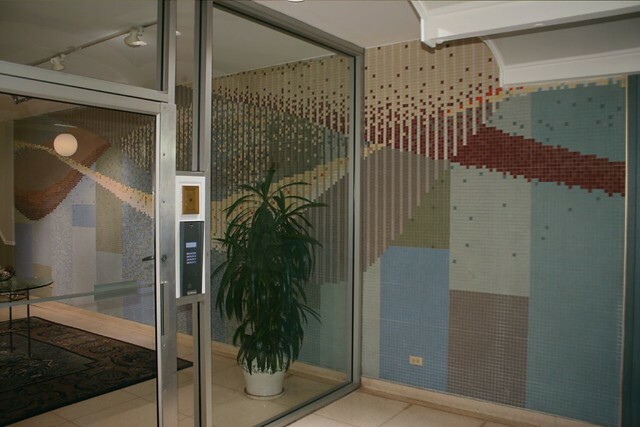 Inside, the lobby features a wonderful abstract mosaic along one side. 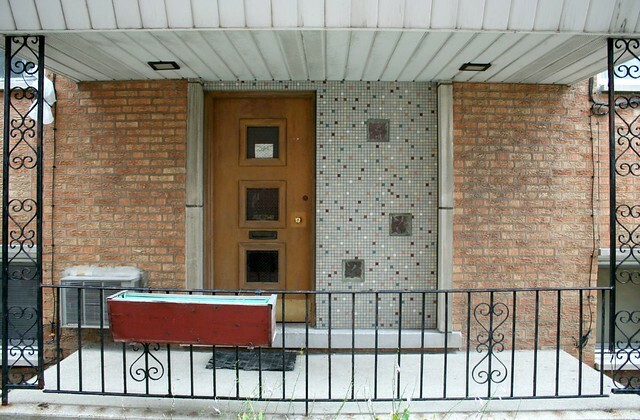 The mosaic extends through the glass front wall into the vestibule. 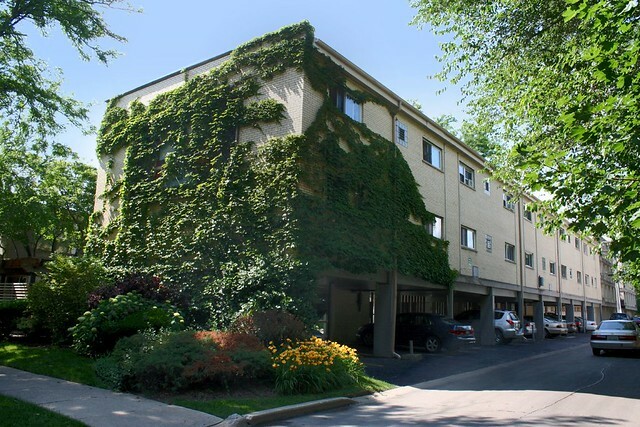 A curious little courtyard apartment building from around 1963, with 4-Plus-1 style parking under one wing, and the other wing at ground level. 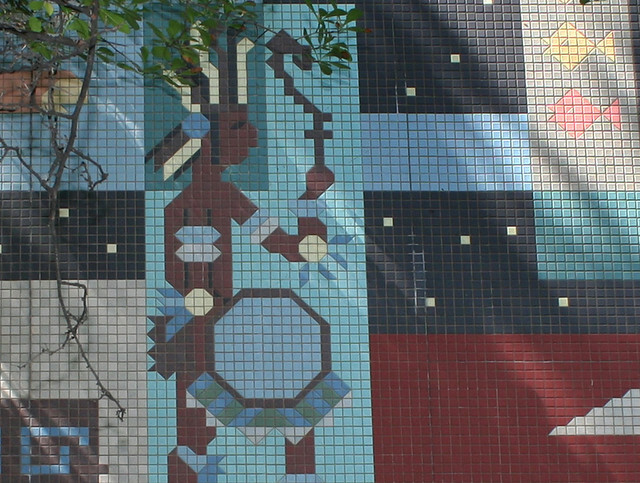 On the street facades, two tile mosaics reflect Native American or Aztec themes. 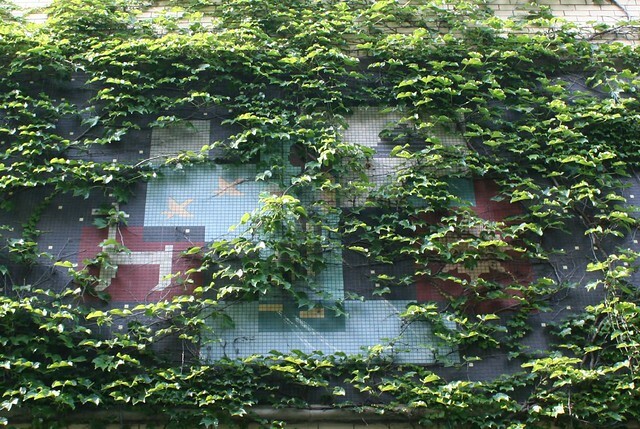 Unfortunately, the eastern mosaic was mostly covered by climbing vines when I photographed it. 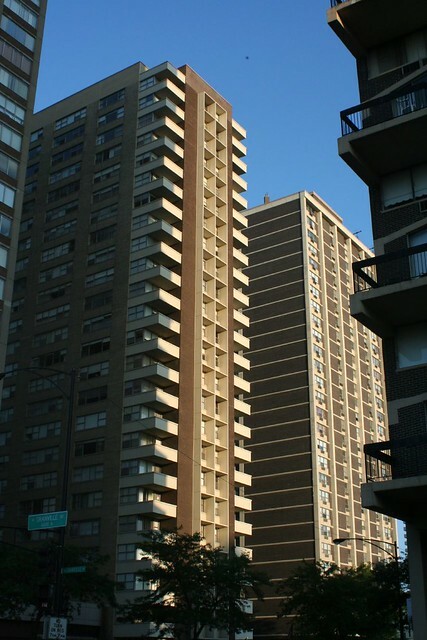 A residential highrise at 6157 N. Sheridan, by architect Irving M. Karlin Associates (J.J. & I.M. Karlin). Planned in 1957, El Lago broke ground in Sept. 1958, built on the site of the George Leahy home, president of Republic Coal and Coke. 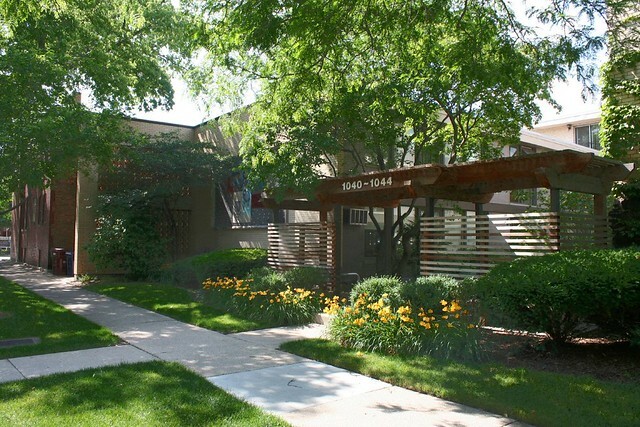 The structure was built utilizing federal housing insurance that covered mortgages. 22 stories, 268 apartments. The El Lago tower was built with a “Mexican motif” meant to convey a warmth missing from contemporary buildings. 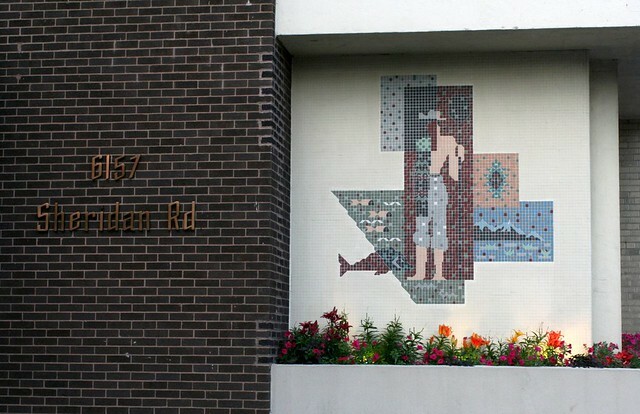 The primary result seems to be the two tile mosaics flanking the entrance, portraying a man and a woman of Mexican heritage. 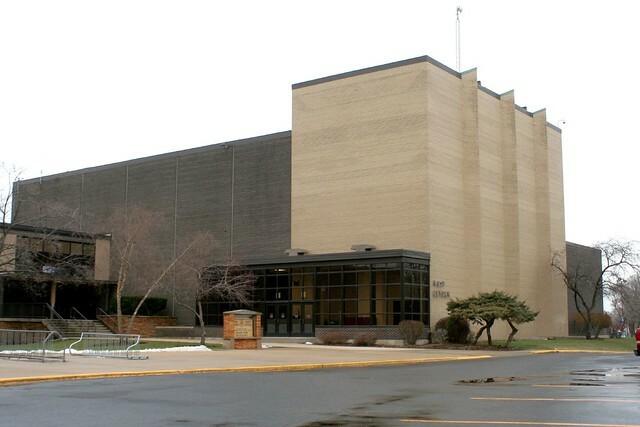 This multipurpose commercial building was built for real estate developers M. Suson & Associates, circa 1959. 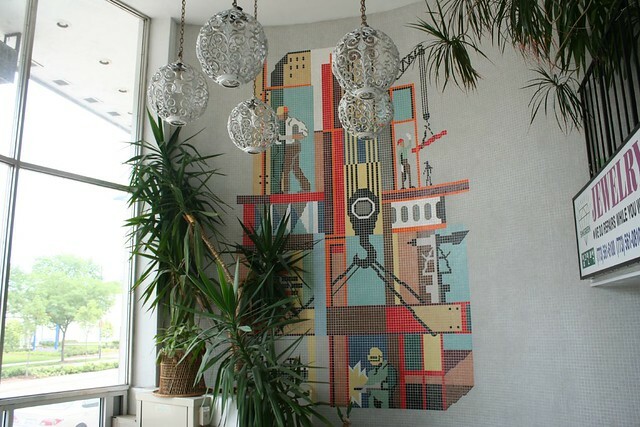 Inside the curvaceous lobby, a tile mosaic depicts the building trades at work, reflecting the primary tenant’s occupation. 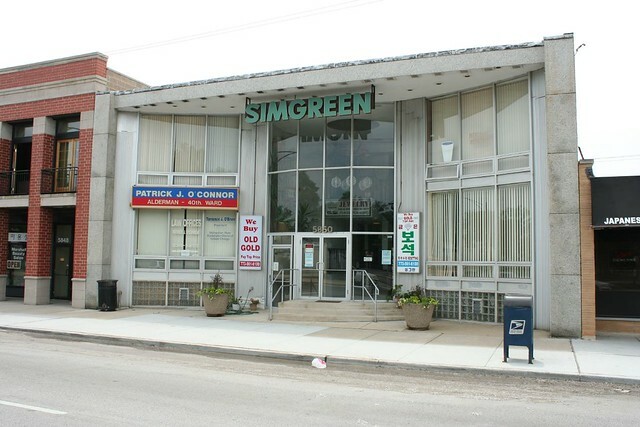 Other offices located here over the years include Vacations Enterprises in 1959 and Simgreen Jewelers by 1989. Today it houses an alderman’s office and a gold shop. 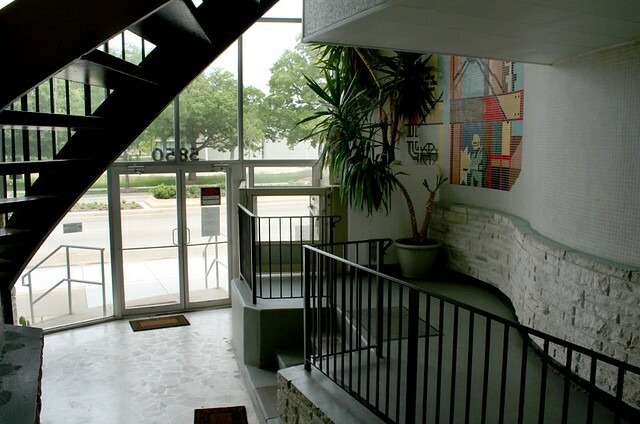 A mixed-use building with commercial spaces facing Western Avenue, and access to the upper-floor residences on the side street. 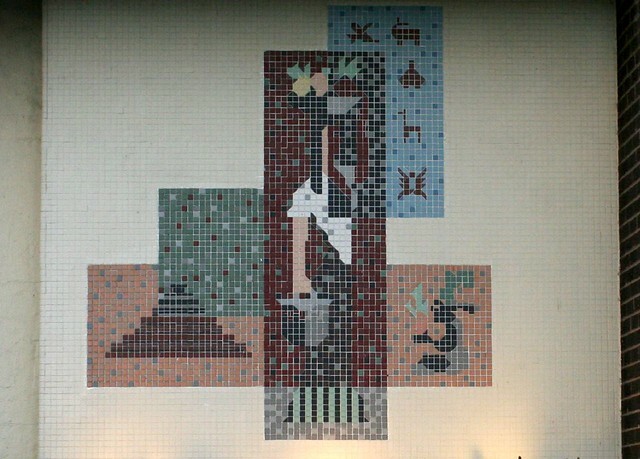 The apartment entry is marked by an abstract design in 1×1 tiles. 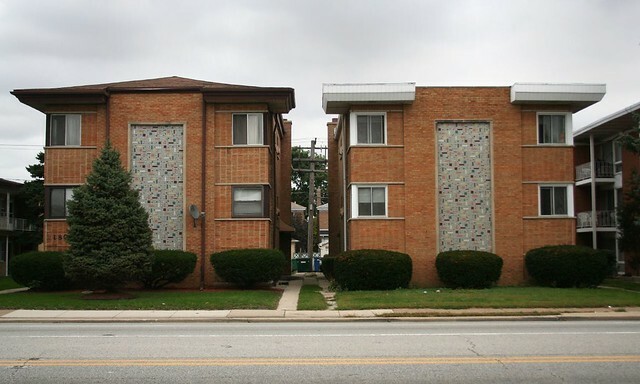 his pair of 6-flat apartments is part of a long row on Harlem Avenue of the same vintage and scale. 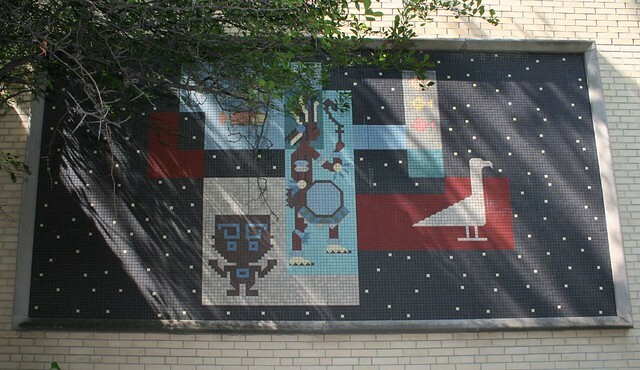 These two feature an abstract pattern of colored tiles, with a minor echo of the motif around the entrance. 1000 Wolf Road, Northlake. 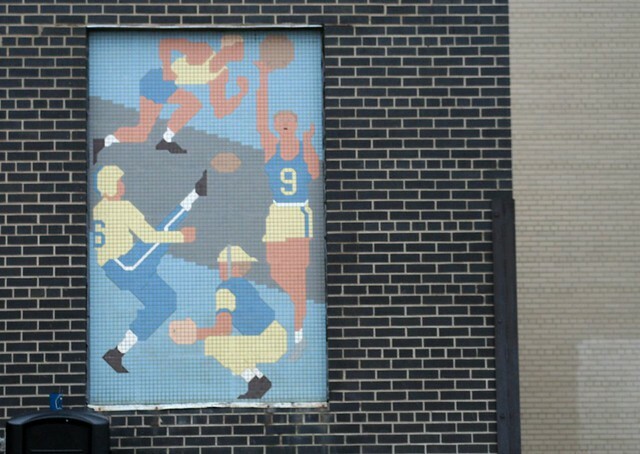 A 1957 building with somewhat workmanlike mosaics decorating its wings, portraying the various areas of academics, learning, athletics and high school life. 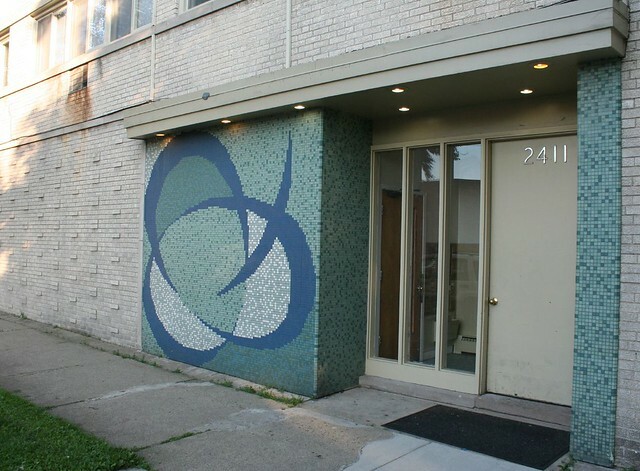 This entry was posted in Lincoln Avenue, Midcentury Modernism, Mosaic Tile, Murals, Wall Art and Graffiti. Bookmark the permalink. I love your appreciation of what often goes unnoticed and unappreciated, along with your fine photography and comments about these great places in and around Chicago. Thanks for sharing. I’m a fan! This is fantastic! I found your blog post via gapersblock.com today. 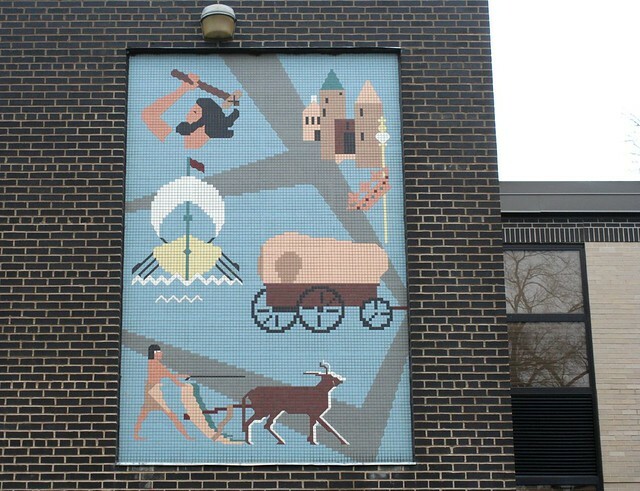 As a public spaces artist, I really enjoy seeing your collection of 1×1 murals. 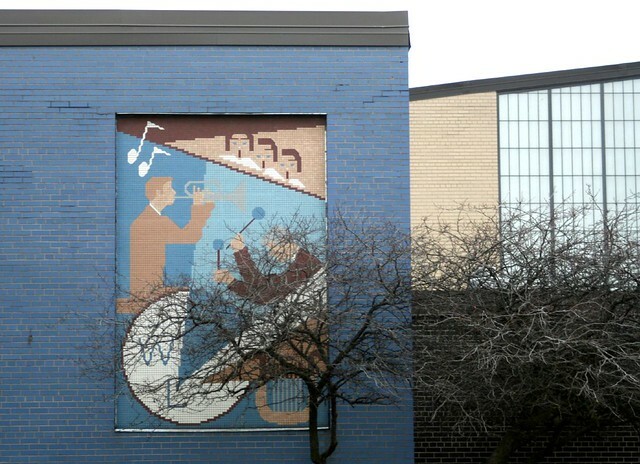 I have a soft spot for these type of murals as they remind me of bitmap art.